The Old Guard period of tango began at the turn of the 19th century and really gained momentum just before the First World War. The music has been put into periods by some, including Horacio Ferrer in his book 'The Golden Age of Tango'. 1910-1925 The Guardia Vieja period 2. Tango becomes known world wide, pianos appear in orchestras, tango songs appear, sextets are formed and stage tango appears. 1925-1940 The Guardia Nueva period 1. Orchestras evolve, tango is played on radio and features in films, milongas begin, singers perform with oerchestras. 1940-1955 The Guardia Nueva period 2. The poetry of the tango excels, more orchestras form and reform with singers, clubs have huge tango dances, jazz discovers tango, tango goes to Japan, tango LPs appear. 1955-1970 the Avant-garde period. Tango is repressed in the dance halls of Argentina by the military regime. Tango of the 40s and 50s goes to Europe, large orchestras decline, tango appears on TV. 1970-1985 The Contemporary Period. Stage tango evolves, tango is created in Europe and big productions appear. 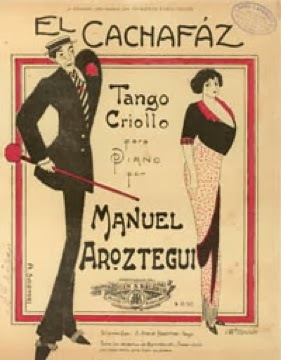 Tango is written for classical orchestras. A thoroughly researched and well-written history of tango, written by Christine Denniston can be found on her website.